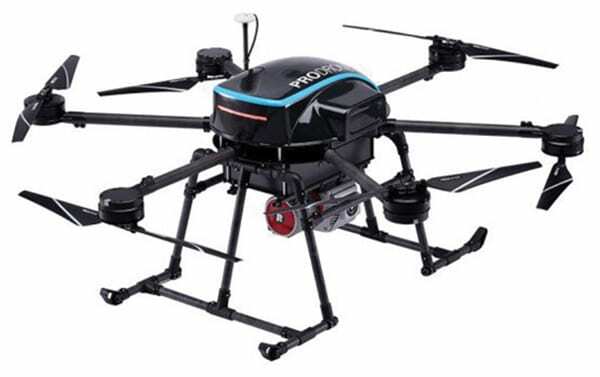 The PD6B-Type II (photo) is a large-platform aerial drone equipped with a geofence system and a built-in safety unit. When deviating from flight safety range or altitude, it is possible to self-activate a parachute to make the drone land safely. The PD6B-Type II comes with a maximum payload of 30 kg (66.1 lb) in a compact design that make it easy to carry and deliver. It adopts a layout in which the propeller does not wrap when spreading by reversing the mounting direction of the adjacent motor. As a result, the distance between the shafts is shorter than the previous six-rotor machine. The overall height is 550 mm and the machine weighs just 11.5 kg. The PD6B-Type II’s smooth flight and interchangeable battery packs makes it possible to acquire survey data using laser sensors with high precision. The drone’s maximum speed is 60 km/h and it can operate in wind speeds up to 10 m/s (22.4 mph). — ProDrone Inc., Mountain View, Calif.